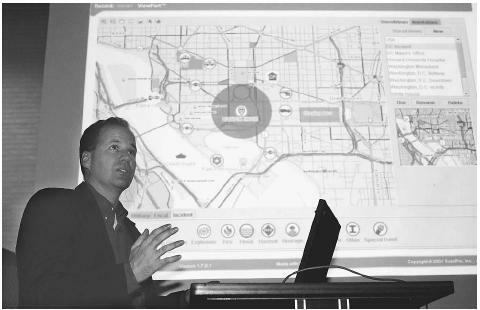 The Lightweight Epidemiology Advanced Detection and Emergency Response System, better known as LEADERS and demonstrated in this photo, reaches into hospitals and can send fast, automated alerts by scanning electronic records for clues to a bioterror disease outbreak. geared toward the security of U.S. nuclear stockpiles, while its Nuclear Nonproliferation Verification Research and Development Program works for security in the broader, more global sense. NNSA also has intelligence and incident preparedness responsibilities. The creation of NNSA was a saga in itself, an outgrowth of concerns over vulnerabilities to Chinese espionage under the administration of President William J. Clinton. Even as political opponents in the Republican Party accused Clinton and Vice-President Al Gore of accepting illegal campaign donations from the Chinese, information surfaced regarding Clinton appointees with close ties to the People's Republic of China. Of most concern were allegations regarding the illegal sale of defense technology to China, as well as evidence of Chinese spying at nuclear labs. In response to these concerns, Congress in 1999 created NNSA as a "semi-autonomous" agency within DOE. Energy Secretary Bill Richardson, along with other members of DOE leadership, maintained that the new agency would create confusion, obscure the chain of command, and place roadblocks in the way of DOE's environmental and safety oversight roles. Nevertheless, Clinton signed the legislation, which had been linked to defense appropriations for 2000. Clinton then authorized Richardson "to perform all duties and responsibilities" of the newly created Under-secretary of Energy for Nuclear Security position, the director of NNSA. In so doing, he effectively circumvented the congressional attempt to pull nuclear materials from direct DOE authority, a move that infuriated congressional Republicans. Under the threat that Congress would cut the pay of top DOE officials, Richardson met with House leaders. After some discussion, the White House put forward former Air Force General John Gordon, then serving as deputy director of the Central Intelligence Agency (CIA), as the first NNSA director and undersecretary for nuclear security. NNSA, which began operation on March 1, 2000, has the mission of improving national security through defense uses of nuclear energy; maintaining the U.S. nuclear stockpile, and enhancing its safety, reliability, and performance; providing the U.S. Navy with safe, reliable, and effective nuclear propulsion plants; advancing nuclear safety and nonproliferation internationally; reducing the global threat posed by weapons of mass destruction; and supporting America's leading role in the realms of science and technology. The NNSA administrator oversees all functions of NNSA except those accorded to the deputy administrator for naval reactors by Executive Order 12344 (Naval Nuclear Propulsion, February 1, 1982). The administrator's responsibilities roles include strategic management, policy development and guidance, program management and direction, budgets and other financial matters, resource allocation, safeguards and security, emergency management, environment and health matters, administration of contracts, intelligence, counterintelligence, personnel, procurement, legal matters, legislative affairs, public affairs, and interactions with other DOE offices and other units of federal, state, and local government. NNSA staff supports the administrator in a number of these functions, particularly counterintelligence, nuclear security, legal affairs, policy planning and assessment, legislative and intergovernmental affairs, public affairs, and matters of the environment, safety, and health. Also reporting to the administrator are deputy administrators for defense programs, nonproliferation, and naval reactors. There are also associate administrators for facilities and operations, and for management and administration. At the heart of NNSA is the Nonproliferation Verification Research and Development Program, which operates, or has operated, a number of programs. Among these is the International Materials Protection, Control, and Accounting Program, whereby NNSA personnel work with Russia and former Soviet republics to ensure against proliferation, to return to the country of origin all weapons-usable nuclear materials, to convert or dispose of those materials wherever possible, and to develop new safeguards. The Nonproliferation Verification Research and Development Program is responsible for creating and testing detection systems that will advance America's ability to respond to national threats from nuclear, chemical, or biological weapons. Its three principal elements are the monitoring of nuclear explosions and tests, a function overseen by DOE; proliferation detection; and the Chemical and Biological National Security Program (CBNP). Nuclear smuggling and threat assessment. As explained by Linton F. Brooks, NNSA administrator under President George W. Bush, in a statement to the House of Representatives Energy and Commerce Committee on July 9, 2002, the technologies developed in the proliferation detection segment serve functions both of nonproliferation and homeland security. Accordingly, those areas supportive of homeland security that could be separated from NNSA would move to the new Department of Homeland Security (DHS). Among the key components of the proliferation detection program is the nuclear smuggling component. In this area, NNSA, together with the U.S. National Laboratories, put to use unique insights regarding nuclear proliferation, including the characteristics or "signatures" of particular weapons. Working with such future DHS agencies as U.S. Customs and the U.S. Coast Guard, as well as the departments of Transportation and Justice, NNSA had conducted demonstrations of radiation detection methods at international ports, border rail yards, and airports. Also scheduled for transfer was the DOE Nuclear Threat Assessment Program. Initiated at Lawrence Livermore National Laboratory in September 1978, the program had been applied in assessing the credibility of more than 60 threats of nuclear extortion, 25 claimed threats to nuclear reactors, 20 non-nuclear extortion threats, and some 650 instances involving the attempted or alleged sale of nuclear materials. As nuclear threats are a federal violation, credibility assessment teams work under Federal Bureau of Investigation direction, in conjunction with representatives of CIA, the Defense Intelligence Agency, Customs, and the State Department. In the aftermath of the September 11, 2001, terrorist attacks, one of the key tasks of the program was the separation of critical from non-critical information as to possible threats. CBNP. Also moved to DHS was CBNP. CBNP actually predates NNSA, having been initiated by DOE in 1997 to respond to events such as the Tokyo nerve-gas attack that took place two years earlier. The program develops systems and technologies to protect civilian populations against the threats of the modern battlefield. NNSA and the national laboratories of DOE have undertaken extensive studies in chemistry, biology, materials science, and engineering to develop prototypes, which, if approved, can actually be manufactured by outside bidders. For example, CBNP, in conjunction with the Centers for Disease Control, conducted research on the biological foundations required to establish signatures of biological agents—that is, DNA profiles of pathogens, such that medical personnel would be able to more quickly treat victims. These signatures would also provide forensic evidence for the prosecution of terrorists. One practical creation of this program may be a palm-sized device, identified by a CBNP project manager in early 2001 as the Chemlab, that will be able to detect and identify biological agents quickly and accurately. To maintain cost effectiveness, CBNP attempts to use existing technology as much as possible. For example, one area of research is in microchips or cards that could plug into existing palm-size computers to detect dangers ranging from toxins to viruses. CBNP also adapted existing technology for its RSVP, or Rapid Syndrome Validation Program, a software package that makes it possible for doctors to network regarding the symptoms they see in patients—a highly useful tool in the event of a biological attack. CBNP also conducts or directs exercises, such as the PROTECT subway demonstration, designed to simulate the 1995 Tokyo attacks. In the Nevada desert, at a site where nuclear tests were once conducted, NNSA operates the Weapons of Mass Destruction Terrorism Response Domestic Preparedness Program, a counterterrorism training facility. Up to 100 personnel from law-enforcement and emergency-response departments around the country train there, undergoing rigorous simulations that may involve being woken at 2:00 a.m. with cries of "Terrorists have taken hostages at a nuclear facility!" Among those trained at the site prior to September 11, 2001, were New York City law enforcement personnel who later put their training to use in an all too vivid real-life experience. Homeland Security: Hearing Before the Committee on Energy and Natural Resources, United States Senate, One Hundred Seventh Congress, Second Session on the Present and Future Roles of the Department of Energy/National Nuclear Security Administration National Laboratories in Protecting Our Homeland Security, July 10, 2002. Washington, D.C.: U.S. Government Printing Office, 2002. National Nuclear Security Administration: Joint Hearing Before the Committee on Energy and Natural Resources and the Committee on Governmental Affairs, United States Senate, One Hundred Sixth Congress, First Session on the Department of Energy's Implementation of Provisions of the Department of Defense Authorization Act Which Create the National Nuclear Security Administration, October 19, 1999. Washington, D.C.: U.S. Government Printing Office, 2000. Safety and Security Oversight of the New National Nuclear Security Administration: Joint Hearing Before the Subcommittee on Energy and Power and the Subcommittee on Oversight and Investigations of the Committee on Commerce, House of Representatives, One Hundred Sixth Congress, Second Session, March 14, 2000. Washington, D.C.: U.S. Government Printing Office, 2000. The Secretary of Energy's Priorities and Plans for Department of Energy National Security Programs: Hearing Before the Committee on Armed Services, United States Senate, One Hundred Seventh Congress, First Session, February 8, 2001. Washington, D.C.: U.S. Government Printing Office, 2002. Bleek, Philipp C. "New DOE Nuclear Security Organization Begins Work." Arms Control Today 30, no. 3 (April 2000): 29–30. Dao, James. "Nuclear Study Raises Fears About Weapon." New York Times. (November 17, 2002): section 1, p. 22. Gorman, Tom. "Rescue Worker Boot Camp." Los Angeles Times. (October 11, 2001): A6. Johnson, Jeff. "Unclear Future at Weapons Labs." Chemical & Engineering News 78, no. 49 (December 4, 2000): 51–58. Pincus, Walter. "DOE Plan Riles Senate GOP: Choice of Richardson to Run New Bomb Agency Spurs Pay Threat." Washington Post. (October 19, 1999): A17. ——. "Nuclear Security Gets First Director: Gordon Confirmed as GOP Blasts His Boss, Richardson." Washington Post. (June 15, 2000): A31. Warchol, Glen. "Beam Us Up, Scotty: 'Tricorder' May Fight Biological Threats." Salt Lake Tribune. (May 7,2001): D1. National Nuclear Security Administration. < http://www.nnsa.doe.gov > (March 7, 2003).